The Double RazorDagger (DRD) has a width of 1.25-inches at the center – it tapers into twin Tanto Needle Nose Points (2x points) one point at each end of the DRD. The DRD is manufactured in 9″, and 10″ lengths – it is designed for 1.25″-1.5″ or wider belts. The DRD has a wide/strong blade for superior cutting and thrusting. 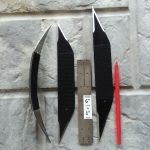 The DRD is sold as one blade in a special Safety Sheath (SS); easy to use…deploys one Double RazorDagger.